Composed by Collin Bay. Saddle-stitched. 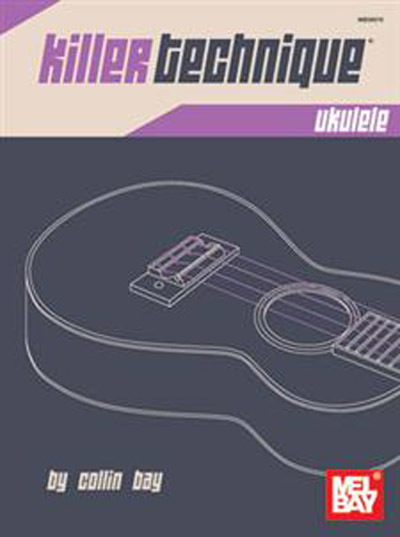 Killer Technique: Ukulele is a technique and daily study book inspired by Corey Christiansen's "Gig Savers: Killer Technique" book for guitar (MB20028). This book provides concepts and daily routines to help players gain facility on their instrument by improving technique and avoiding injury. The exercises can be used as a warm-up or as full-speed technical studies. Many of the exercises focus on one hand or the other; others are designed specifically to improve synchronicity between the two hands. It is useful for musicians of any level. The exercises are presented in string numbers, fret numbers and fretboard diagrams rather than standard notation or tab. This book will work for any variety of ukulele-soprano, tenor, concert, baritone, and bass. The exercises are designed for use with a pick but can easily be adapted for fingerstyle players as well.